Polar fleece scarves are warm and bright, and you can have a stack of them made up in no time for last minute Christmas gifts! Polar fleece doesn’t fray, so you won’t have any hemming to worry about. I estimated the length after wrapping a little around my own neck, and cut widths from six inches for the oldest child down to four inches wide for the littlest toddler. Cut squares for the pockets an inch less than the width of the scarf, then sew them on about an inch from the bottom of the scarf. 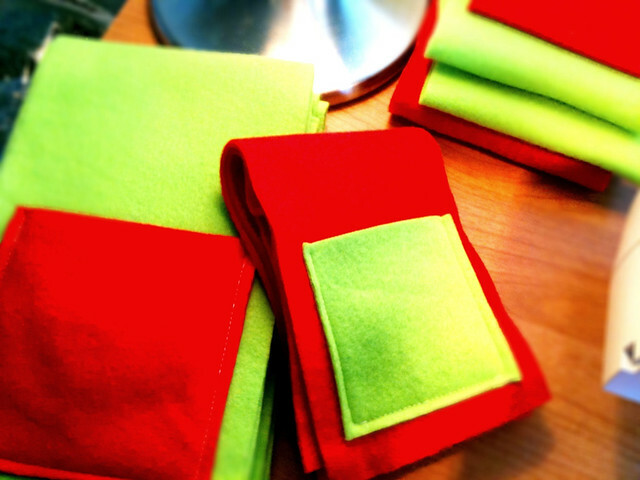 For a completely no-sew version, just cut lengths of polar fleece, then fringe the ends by cutting strips about a quarter to a half inch wide across either end.